Welcome to the first lesson in the Practice Writing DRY (i.e. Do Not Repeat Yourself) Code in Python module. This tutorial provides an opportunity to practice writing DRY code using loops, conditional statements, and functions. This hands-on activity provides you an opportunity to practice working with the DRY code strategies introduced in this course: loops, conditional statements, and functions. While this activity will not be formally graded, you can earn participation points for submitting your completed Jupyter Notebook for this activity. 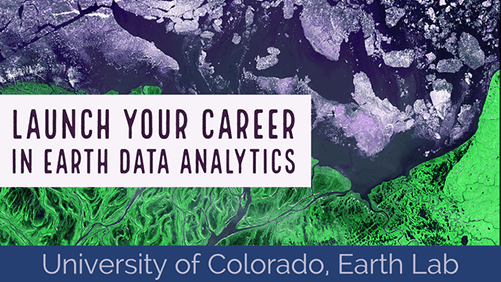 Be sure that you have completed all of the lessons from Days 4-10 for the Earth Analytics Bootcamp. Completing the challenges at the end of the lessons will also help you with this assignment. Begin by creating a new Jupyter Notebook in your forked repository (ea-bootcamp-practice-dry-code). Rename the file to firstinitial-lastname-practice-dry-code.ipynb (e.g. jpalomino-practice-dry-code.ipynb). Add a Markdown cell before each code cell you create to describe the purpose of your code (e.g. what are you accomplishing by executing this code?). In the questions below, you will be working with numpy arrays and pandas dataframes. Each dataset contains a row for each year specified in the dataset name and a column for each month (starting with January through December). Note: you are not required to write a loop to accomplish these tasks. You can follow the same process that you have before to download and import files. Select the second row of data (including all columns) from the numpy array containing the data for 1988 to 1992, and save to a new numpy array. Note that using an index series (e.g. [row_index:row_index, column_index:column_index]) to select the rows and columns will result in a two-dimensional array. Name your new array appropriately to indicate the year of data that it represents. Write a conditional statement that checks whether the numpy array created in the previous question (i.e. the selection) is a one-dimensional numpy array. Print a message stating whether or not the array is one-dimensional. It is easier to write this conditional statement using the attribute of numpy arrays that provides a single value for the dimension (i.e. .ndim), rather than the shape. Recall how to use the comparison operator to check for equality between values (==). This is NOT a one-dimensional array. Modify your conditional statement from the previous question, so that your if and else statements execute different code, not just printing messages. For the if statement, rather than printing a message, print the shape of the numpy array from the previous question (i.e. the selection). These code lines will flatten a numpy array (in this case named arrayname) to a one-dimensional array, save it to a new array called arrayname_1d, and print the shape of the new array. Note the result of this conditional statement. Manually create a one-dimensional numpy array that contains the month names (i.e. January to December). Write a conditional statement to check that this new array for month names has the same shape as the numpy array from the previous question (i.e. the selection). Print a message stating whether are not these arrays have the same shape and can be plotted together. Review the Activity on Data Structures from Day 6 if you need to recall how to manually create a numpy array using np.array(). Note that you are creating this new array using text strings, not numeric values. Reflect on your conditional statement from the previous question. Write a sentence or two on how you could expand on your conditional statement from the previous question to create a plot from the two numpy arrays if they do indeed have the same shape. Hint: what did you do in Question 3 to expand on your conditional statement? Write a loop to run the info() method on the two pandas dataframes that you imported in this activity, and print the results. Recall that creating a list of items to iterate upon is a good first step to writing a loop. Think about what you are iterating upon in this question - do your list values need "" to indicate text strings, or are you iterating on existing variables? Write a loop to run the .describe() method on each column in the pandas dataframe containing the data for 1996 to 2000). Recall that to select columns in pandas dataframes using implicit variables (i.e. not explicitly created by you), change the syntax from dataframe.column_name to dataframe[[column_name]]. Write a function that calculates the mean across columns of a numpy array. Recall which existing numpy function you can use to calculate a mean. You will include this function within the function you write to answer this question. Run the function created in the previous question (i.e. to calculate mean of columns in a numpy array) on the numpy array containing data for 1993 to 1997. Save the output to a new numpy array. You have already learned how to save the output from one run of a function (see Question 9). What if you wanted to run the function on multiple numpy arrays? Write a sentence or two on what you would need to know how to do, in order to save the output from a function that is running on multiple arrays in a loop. Hint: think about how you can append values to a list using a loop (i.e. create an empty list that gets values appended to it in the loop). Guided Activity on Version Control with Git/GitHub to add, commit, and push your Jupyter Notebook for this activity to your forked repository (https://github.com/yourusername/ea-bootcamp-practice-dry-code). Guided Activity to Submit Pull Request to submit a pull request of your Jupyter Notebook for this activity to the Earth Lab repository (https://github.com/earthlab-education/ea-bootcamp-practice-dry-code).